Panicphobia a rock-quintett from Aarhus, Denmark. They play what they like to call playfull rock, which is a mix between progressive and alternative. The music has not been “written” in the more traditional sense, but is sort of collectively composed. Emerging musical ideas have been added a healthy mix of theory combined with observations and intuition along with musical experiments or improvisations. – Five musicians – one band! – a mix between musicians and their styles, likes and dislikes! – a way of playing music without having to wait your turn – music where every second counts. – a way of collectively composing and arranging music. – riffs, guitar-fiddling, creepy baslines, vocal mumbojumbo – musical dialog! – musicians playing it unsafe! – a group of musicians twisting and turning raw musical material untill it’s fun for everyone – including the listener. – another band just waiting for another chance to repeat the chorus. – a group of musicians where everyone is waiting for their turn to “speak”. – just a lead singer and a band! – a band trying to catch a modern vibe. 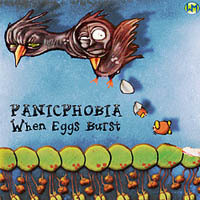 Panicphobia’s debut album “Handle With Care – Might Panic” was released by WM Recordings in 2008. The album is available from all major download stores and from CD Baby. This mini-album is covered under a Creative Commons License. @Jacob Brumbaugh: Can you tell me a bit more about the problem you are having – I just downloaded the album just fine… could you copy & paste the contents of your email? I will do my best to help.